Vehicle Virgins, for those shamefully not up on their YouTube car channels, is a wildly popular channel run by Parker Nirenstein, a man who’s been featured here before because of some online drama about a hood with fellow popular car-Tuber Rob Dahm. One of the cars featured prominently in that channel is an acid-yellow Corvette Z06, a car that was destroyed in a wreck on Saturday. The two passengers in the car, described only as “The driver, a 21-year-old Ypsilanti Township man and the passenger, a 17-year-old Ann Arbor girl,” had to be extracted from the car by emergency responders. Both occupants suffered broken bones, but no life-threatening injuries. 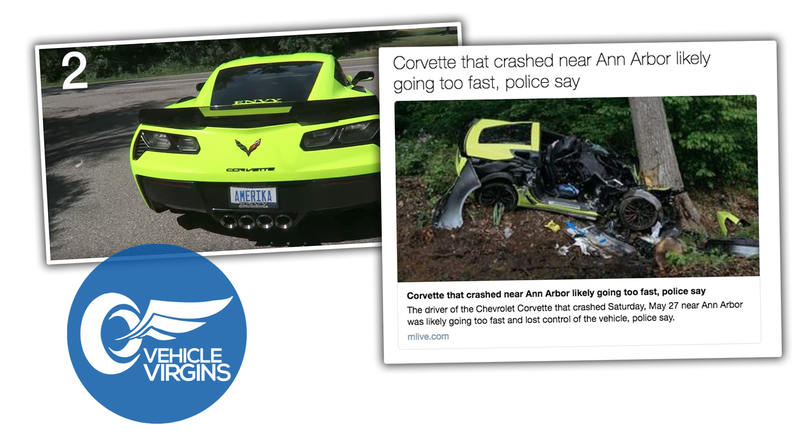 Though no names are given, we can confirm the Corvette is the same one featured in Vehicle Virgins videos, because you can see the license plate of the wrecked car, AMERIKA, matches the one from the videos. The driver of the car isn’t known at this time. Based on this article from 2015 where Parker Nirenstein was 21, Nirenstein was likely not the driver, since the police say that driver was 21, and people do tend to age on a yearly basis. Regardless of who was driving, the whole mess is still a good reminder of some very basic concepts: fast cars are fast, and public roads are not where you want to go nuts with them. UPDATE: The Corvette appears to be owned by Jiefu Jefferey Gong. So the car is not owned by any of the Vehicle Virgins guys, but it is the one that has been used on the channel. A Corvette in a single-car wreck? I'm stunned.